Diabetes, an autoimmune disorder that causes an elevation in a person’s blood glucose level, has existed among the most prevalent diseases for many years. 1According to the World Health Organization (WHO), the global statistics of diabetes among adults over 18 increased from 4.7 percent in 1980 to 8.5 percent in 2014. In 2015, the disease was responsible for an estimated 1.6 million deaths. In the Philippines, about 7.3 million Filipinos are recorded to have diabetes, with 3.5 million confirmed diagnoses. Last year, the country was marked as ‘diabetes hotspot,’ ranking among countries with towering diabetes rates. At this moment, the alarming figures are continuously rising, and every day, more and more people are becoming at risk of acquiring the condition. 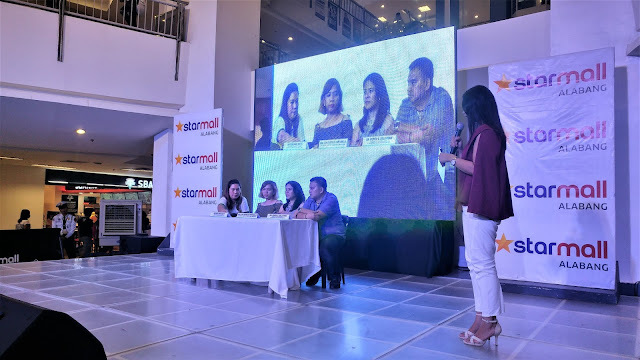 Friendly Alliances and Media Expressions (FAME) Inc., publisher of DiabetEASE magazine, is bringing Sweet Escape, a yearly advocacy event for the public about diabetes awareness happening on August 18, 10am at Starmall Activity Center, Alabang. Top endocrinologists Dr. Augusto D. Litonjua, Father of Philippine Endocrinology and Dr. Joy Arabelle C. Fontanilla, head of Center for Weight Intervention and Nutrition Services (WINS) at St. Luke's Medical Center - Global City and DiabetEASE Magazine Editor-in-Chief shed light on the prevalence of diabetes in the country. With them is Dr. Pepito dela Peña, President of the Philippine Society of Endocrinology, Diabetes, and Metabolism (PSEDM). The experts also tackled the importance of having a balanced diet while maintaining a healthy lifestyle to prevent risks that may trigger the metabolic disease. 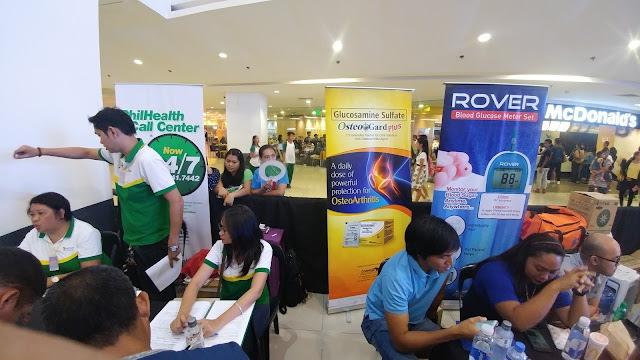 Meanwhile, event partners Diabetes Store, represented by its General Manager Mr. Ramon Felix and PhilHealth’s Public Affairs Unit head Mr. Raymond P. Acoba, also talked about their respective campaigns relating to the metabolic disease. In line with Sweet Escape’s call to have an active and healthier lifestyle, it also brings the second Hataw Na: Hataw Galaw Sayaw sa Kalusugan Intercollegiate Dance Competition. The urban dance competition aims to encourage people of all ages to turn their back on a sedentary lifestyle and embrace being healthy and fit through physical activities such as dancing. Being physically active is an effective practice to avoid diabetes and its complications. By encouraging the youth to prevent the disease in such a fun activity, Sweet Escape believes that more and more people will be informed and take part in the fight against the disease. The event also featured a Zumba party, product highlights, lay forums, raffles, and booth exhibition. 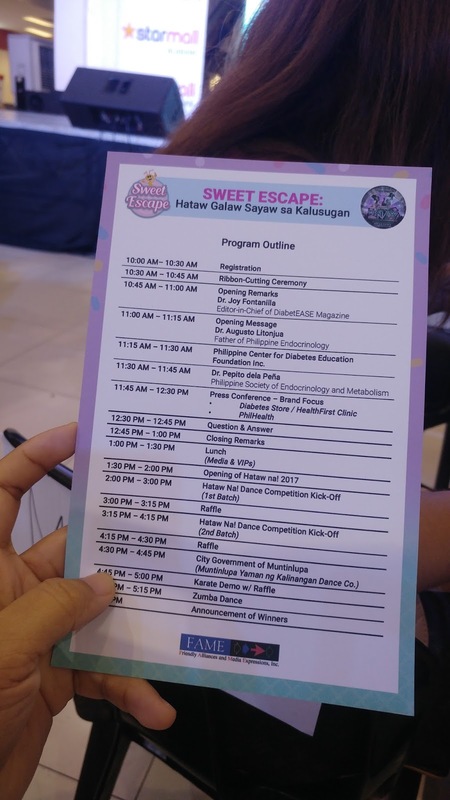 The Sweet Escape 2017 was made possible in cooperation with the Philippine Center for Diabetes Education Foundation (PCDEF) Inc., and Philippine Society of Endocrinology, Diabetes, and Metabolism (PSEDM). 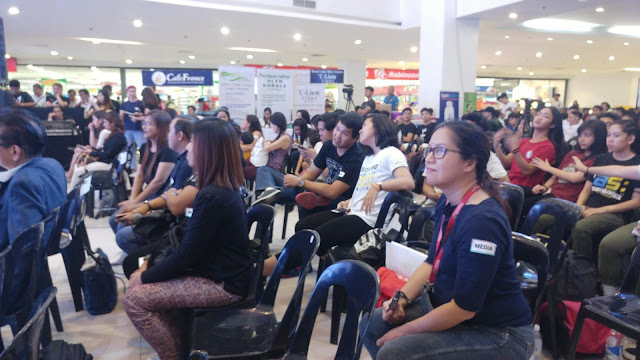 The event was also supported with Starmall Alabang, City Government of Muntinlupa, PhilHealth, Diabetes Store, HealthFirst Clinic, Corbridge, Herbalife Nutrition, Omizu (Beautifying Natural Spring Water), Lightwater amd Musli Biscuits under Suncoast Brands, Monea Salon Professional Series, Philippine Karate-do League Inc., Creative Baker, Enchanted Kingdom, Café France, C-Lium Fibre, Cocoline Naturals, and Coco Natura. Herbalife nutrition was also part of the advocacy. They gave away some products to lucky raffle draw winners. FAME INC. is the publisher of Health and Lifestyle, DiabetEASE, ZEN Health, and Travel Plus magazines. It aims to promote good health, healthy lifestyle, sound Christian values, and professional excellence among doctors, healthcare professionals, legislators, and the laymen. The DiabetEASE magazine is dedicated to bringing to Filipino people a life lived well even with diabetes. It consists of the latest news and discoveries on diabetes, inspiring diabetes stories from real life patients, food tips and recipes, dos and don’ts, and just about everything you need to know for a diabetes-friendly lifestyle.